Cheap flights to Mallorca: Munich-Palma for €59! Another great offer from Ryanair, this time to Mallorca! 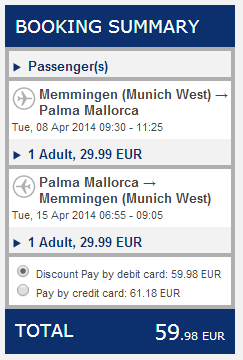 Return flight from Memmingen (Munich West) to Palma de Mallorca is available for only €59 now! Memmingen is 1 hour 20 minutes bus ride away from central Munich, the bus costs €15. This price includes 10 kg cabin luggage, extra luggage is available for €15 one way. Travel dates start already in April. « Cheap flights to Malta: Wroclaw-Malta for €77!